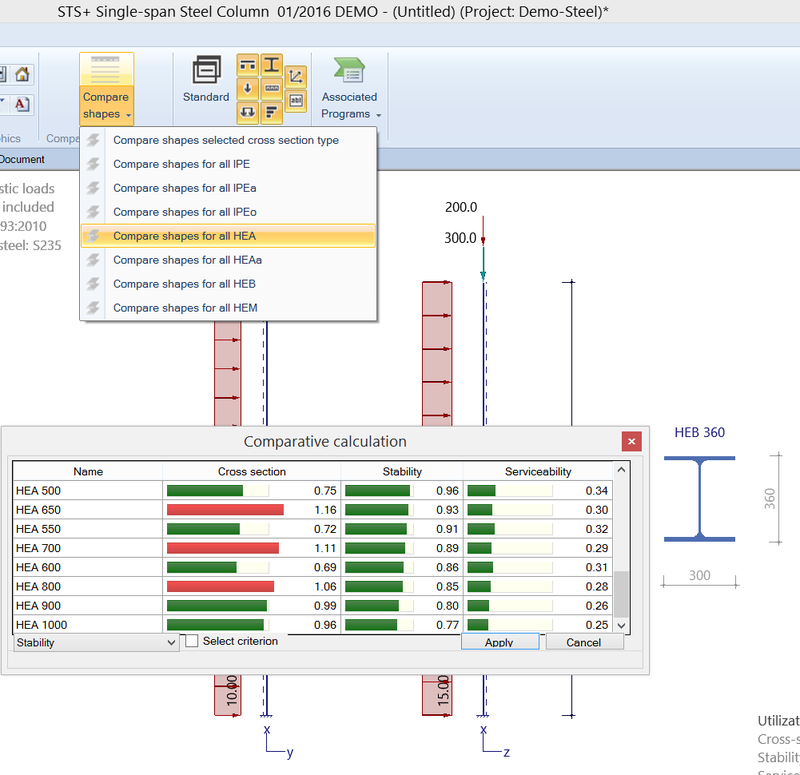 The STS application performs structural safety analyses of steel column system. 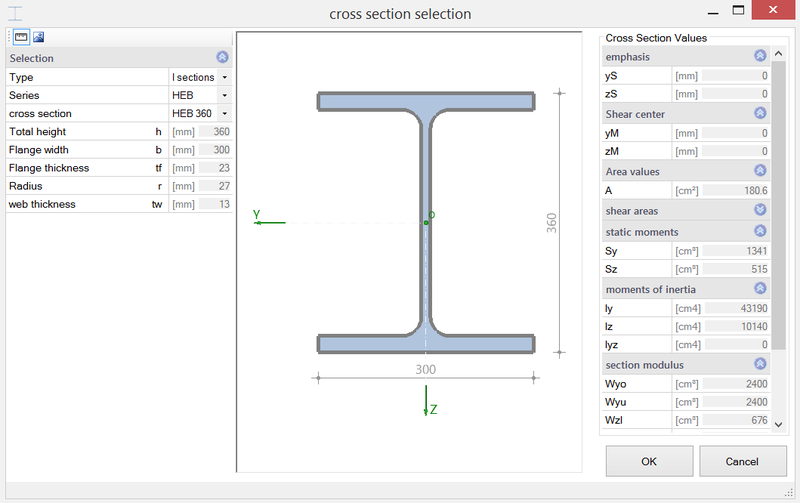 Single-piece and double symmetrical cross sections are allowed. The verification is performed on the basis of ideal bifurcation loads for lateral buckling, torsional buckling and lateral torsional buckling. These supporting conditions always apply to both main axes. Discrete lateral supports and continuous elastic bedding can be defined in addition. For more complex supporting conditions, an interface to the BT II application is available. 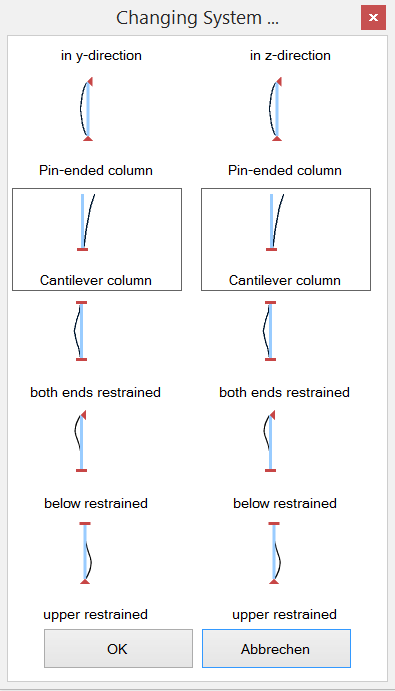 Cantilever columns are often used as bracing elements in hinged column systems. 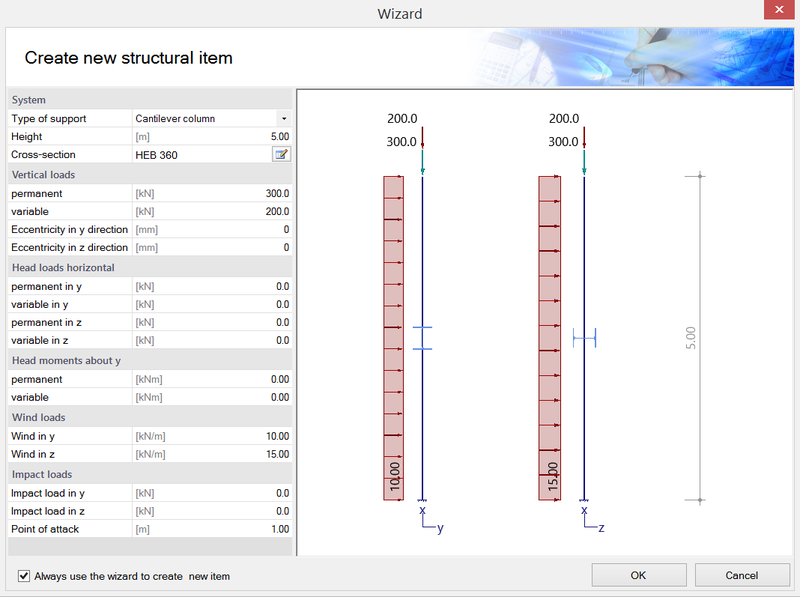 STS calculates automatically the corresponding equivalent loads and takes the change of the effective length into account. In combination with EN 1993, the regulations of the corresponding National Appendix are taken into account. We currently work on the implementation of additional appendices. - Elastic or plastic cross sectional resistance. - at a point x0. 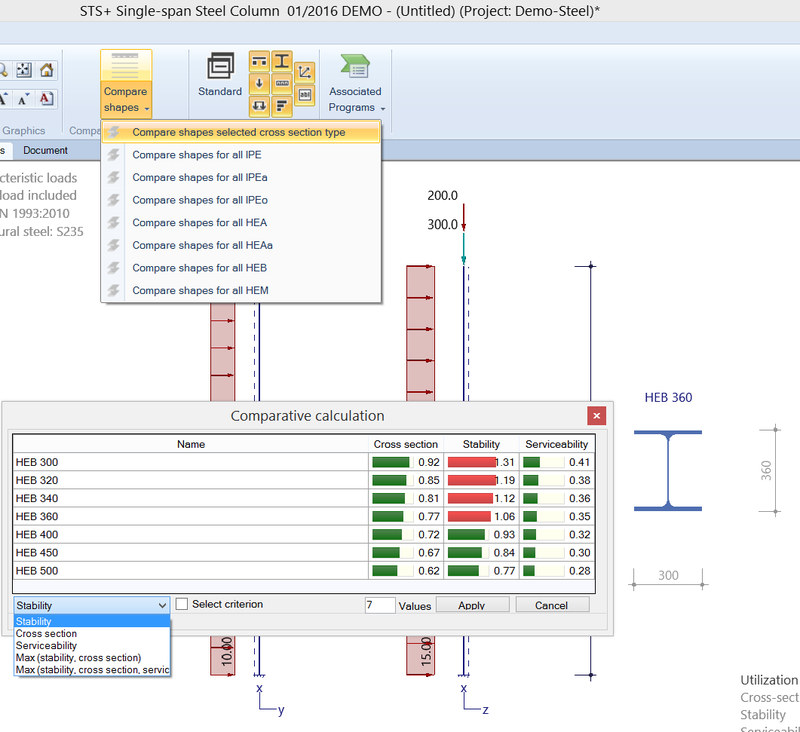 You can expose the column system to vertical and horizontal loading and define head and base moments. However, you cannot define loading that produces planned torsion. Furthermore, you can define appended hinged columns in the directions of the both main axes and optionally apply the self-weight of the column as a resultant to the column head. STS generates automatically the appropriate load cases and load case combinations, depending on the defined actions, and performs the necessary analyses, whereby the decisive load case combination is determined for each limit state. In order to simplify the load definition, STS offers a range of pre-defined loads that are sufficient for most systems. - accidental impact loads in y/z direction as span loads applying to the column head. STS calculates the internal forces and the deformations in first-order analyses and determines the ideal bifurcation loads, the slenderness ratios and the reduction factors for the stability verifications in accordance with the equivalent bar method. The bifurcation loads are determined numerically with consideration to the torsional rigidities. Therefore, the user can also perform structural safety analyses in accordance with the equivalent bar method for more complex loading situations. The characteristic bearing forces can be transferred to the applications FD, ST3 and ST6. If the real load conditions do not comply with the defined standard or the loading situation leads to planned torsion, you cannot use STS for the calculation. If you have a valid licence for the BTII application (2nd Order Buckling Torsion Analyses), you can transfer the structural system to perform second order buckling torsion analyses, if required.